Sid Meier's Civilization: Beyond Earth continues the Civilization computer game series. The game will be available for PC gamers on October 24, 2014. Will Miller and David McDonough are the lead designers for "Sid Meier's Civilization: Beyond Earth." They contributed this article to Space.com's Expert Voices: Op-Ed & Insights. When we were asked to design a new science-fiction entry in the "Sid Meier’s Civilization" series, it was one of those amazing moments when we realized we were going to have the chance to combine a love of game design with a love of science and space exploration. For us, "Civilization: Beyond Earth" has been an opportunity to explore ideas about the future — technology, progress and culture — and think about how settling on a new planet could be the next stage for humanity's progress. In "Sid Meier's Civilization" (Civ), players choose one of the world's great civilizations and then lead their people from the Stone Age to the Space Age, researching technology and building wonders and declaring war, creating an alternate history of Earth along the way. A game of Civ typically ends when one of these civilizations achieves something magnificent. The science victory in Civ has traditionally involved building a spaceship and traveling to a nearby star to colonize a planet. That feels right — settling a distant planet feels like it closes the chapter on this part of human history. But what would this mean for humanity as a species? In "Beyond Earth," we start with the premise that humanity has emerged from a period of great difficulty with a renewed interest and drive in exploring space. In our game fiction, this is galvanized by a few key events, such as the first image of a habitable world, another pale blue dot around a distant star. But it is also driven by need. Settling an extrasolar planet would be a massively resource-intensive process, and as resources become scarce, eventually, there won't be enough to support mass colonization, which is an idea we're referring to as the Inflection Point. Instead of taking control of Stone Age settlers as they would in Civ, players in "Beyond Earth" will be leading one of the expeditions that leave Earth during the Seeding, before the hard reality of the Inflection Point makes it hard to do so. The next chapter of humanity will be defined in terms of what humans do when they leave this planet and start to spread out through the universe. Technology research and progress are key parts of the game of "Civilization." In Civ, players progress through a technology tree, researching progressively more sophisticated technology, from the wheel to navigation to civil service to internal combustion and, eventually, Tech like the Internet and spaceflight. In designing "Beyond Earth," we recognized early on that a linear technology tree felt too certain, so in "Beyond Earth," technologies are arranged in a web, showing that humanity might pursue any number of technological directions in the future, and leaving those discrete choices in the player's hands. But the earliest Techs that players will acquire draw inspiration from research being carried out by the world's space programs: habitation for living on alien worlds, engineering solutions for compact and efficient power plants, and genetics for medicine and health. 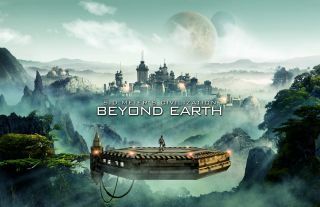 2K Games and Firaxis released a promotional graphic for the forthcoming computer game: Sid Meier's Civilization: Beyond Earth, due in October 2014. Working on "Beyond Earth" has been an amazing opportunity to continue to learn about current directions in research and engineering. Every time we've come up with a gameplay idea, and we've thought: "If only there were some sort of science we could hang this on," we've found a real and promising current direction being explored. When we were building one of our victory conditions (making contact with a sentient alien species), we wanted to know more about communications over the vast distances of space, which, in turn, led us to reading about quantum entanglement being used in communications. It's been exciting to learn that no matter how strange our ideas are, reality is often stranger, and the future feels a lot closer for realizing those ideas. So, buried through the game are bits of what we've learned about thorium reactors or transgenic medicine or climate engineering. As designers, our main goal is for people to enjoy playing "Beyond Earth," but if our players run across something in the game, and they're curious enough to look into it a bit more, then we'll be ecstatic to have done our part to raise a little more love for space and science. Maybe that player will go on to bring us a little closer to the next chapter for humanity. You can pre-order "Civilization: Beyond Earth" on Amazon.com. The video game is set for release in October 2014.